The Rare But Wonderful Peruvian Orange Stripe Tarantula (Lasiodorides striatus)! Welcome to part one of a series I am working on where each time I will focus on one tarantula in my collection. The photos used are of my actual tarantulas and the information I include is based on my own experiences. Please keep in mind that my experiences may differ from yours so just because I say it here does not mean that it is set in stone. I am just sharing what works for me. Lasiodorides striatus (pronounced Lah-sigh-oh-door-eye-dees stry-ate-us), also known as the Peruvian Orange-Stripe, is a hard to find species in the hobby. In the 90’s, when I got my female, these were often sold as Goliath Orange-Stripes on pet store dealer lists. 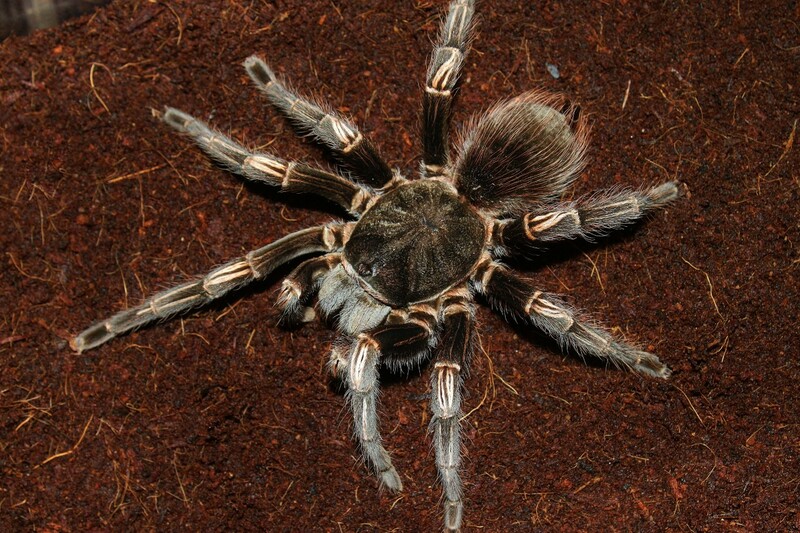 This lead to some confusion in the pet trade as they were often purchased thinking they were actually Goliath Bird-Eating Tarantulas (Theraphosa blondi at the time). I was actually looking for a blondi and the owner of the mom and pop pet store that I went to said he could get them and this is what I ended up with. Though not a blondi it is still a very interesting and easy-to-keep species.